It’s tempting to think that I have no power to make the world better. But I believe that is not true. One way I can be powerful is in my purchasing decisions. Here is one example. Thistle Farms' mission is to HEAL, EMPOWER, AND EMPLOY women survivors of trafficking, prostitution, and addiction. Participants learn skills and increase confidence by running businesses which produce candles, skin care products, essential oils and more. Elizabeth started a virtuous spiral by purchasing candles and body lotions as Christmas presents. I was delighted by the quality and fragrance of these products. As I used them, I researched the enterprise. I found that Becca Stevens, the originator, credits a childhood incident of sexual abuse with giving her the motivation to help other women deal with their histories of abuse. She says she is actually grateful for that experience, as it has given her insight and empathy for those she works with. Thistle Farms is a very impressive organization, now with a twenty-year history. So. When I moisturize my face or hands, or when I light a lavender-scented candle, I bless Elizabeth and her generous heart, I bless those who made these products and are working to heal their damaged selves. I breathe deeply and ask for healing for myself. I thank God for those in the world like Becca Stevens and Elizabeth Manning. And I regularly buy more candles and body lotion to use and to give away. P.S. Why Thistle? It’s because the “mean streets” these former prostitutes were working on were so barren and dead to the natural world that often the only signs of life would be purple-blooming thistles in the pavement cracks. These hardy plants became the symbol of the toughness and perseverance of those trying to improve their lives. And, of course, of God’s amazing ability to create beauty and life anywhere, even in cracked concrete. Karen Manning found that her varied, even eccentric, interests were put to good use as a public library director, helping folks enrich their lives with books and other media. 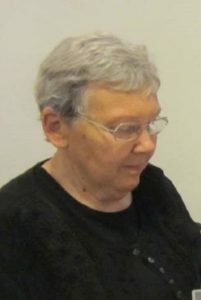 In retirement, she continues to provide piano and organ music for Maquoketa UCC services, plus volunteering at the local nature center and a downtown arts center. Though she has questions about the future of the church as we have known it, the creative kindness of people and the astounding abundance and diversity of the creation give her hope and joy.